Cornerstone Blog: Praise God for a Tremendous 2013 Vacation Bible School! Praise God for a Tremendous 2013 Vacation Bible School! Our 2013 Vacation Bible School concluded last Thursday night, and what a great week we had together! 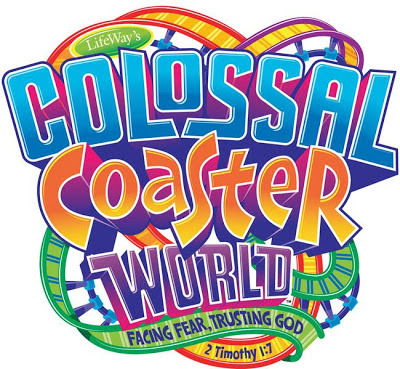 "Colossal Coaster World" was our theme, based off of 2 Timothy 1:7. Life can be a real roller-coaster, with many ups and downs. But God has made a way through Jesus Christ for us to not live with a "spirit of fear," but with His own Spirit of "power, and of love, and of a sound mind." Through the week, we had the opportunity to share the love of Jesus Christ with people of all ages - from babies to adults. We had our largest total enrollment ever, with 229 registered! Our nightly average attendance was 172, and we had seven professions of faith in Jesus! It is impossible to thank everyone sufficiently who had a part in making VBS a great success. I want to thank my wife, Rose, who directed our VBS, and Sally S. who assisted her in getting all the classes and teachers recruited and lined out. Our teachers and helpers in the classes did a tremendous job of preparation, and led their classes with great commitment and love for their students. The meals prepared each night by our Kitchen Staff were outstanding, and really make our VBS much easier for everyone to attend. They had a wonderful clean-up crew, who cleaned the Large Fellowship Hall and washed everything up following the meals. Our security folks made the rounds and stood by the doors - and did a little solving of the world's problems on the side! I want to say a special thanks to our Recreation crew who did a great job of keeping the kids active and having a great time each night. They were worn out by the end of each evening after three hours of activities with the kids each night! Our bus drivers were so faithful to go out and pick up those who needed a ride to VBS. They started at around 4:00 PM and were the last ones home each night. They are unsung heroes, and we appreciate them so much! Our office staff worked tirelessly to get everyone registered and counted before, during, and after VBS. We appreciate their excellent behind-the-scenes work. The Craft Team did an outstanding job leading the children in making things each night that both gave them a lot of enjoyment, but also reinforced God's love for them! Finally, a special thanks to the Music Team that not only led the kids in music each night, but also prepared for our Family Night Musical in just four days! They did an outstanding job, and it was a great blessing to see all the kids participate. The Youth did an amazing job with the script portion of the Musical. Aaron and Paul put together a great video that gave everyone a 5-minute synopsis of what VBS 2013 was like! Once again, thank you to all who worked in, prayed for, and attended VBS 2013. It is a huge ministry and outreach for our Lord Jesus Christ, and we give praise to God for His blessing and guidance. May the seeds planted this year yield an abundance of fruit for God's Kingdom in the days and years to come! Note: I updated our total enrollment to 229. It turns out several folks got double-counted initially. It's still our largest enrollment!